The Alcatel-Lucent 8242 DECT handset offers a rich on-site mobility communication experience, leveraging all capabilities of the powerful OmniPCX Enterprise Communication server and OmniPCX Office RCE. Day-to-day communication activities are made easier for mobile workforces, with new 8242 DECT features such as a large color screen for crystal-clear readability, HD audio-ready technology for superior sound quality, Bluetooth® technology for headset use, as well as USB connectivity. 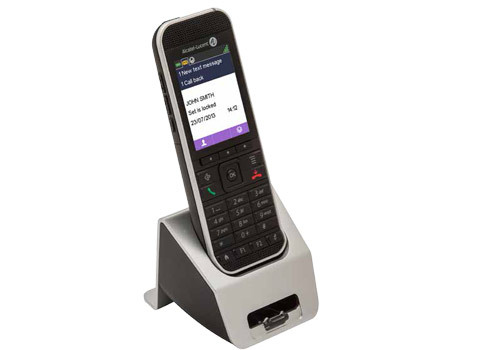 Designed as a high-end business terminal, the 8242 DECT handset also provides notification and location capabilities, as well as a one-button alarm function to address vertical markets such as hospitality, healthcare or any other on-demand environment.